Time testing: one test 4 minute – 60 Test/Hour. L-Malic acid is oxidized in an alkaline environment through an enzymatic reaction and converted into oxaloacetic acid, which in turn produces NADH. 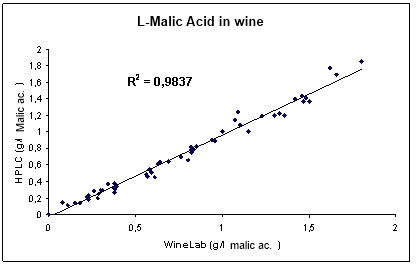 The increase of absorbance, measured at 366 nm (end-point), is directly proportional to the concentration of L-Malic acid in the sample. L-Malic Acid was last modified: February 8th, 2019 by CDR s.r.l.